FREDERICKSBURG, VA (WWBT) - A day after Donald Trump controversially claimed African-Americans have nothing to lose by voting Republican in November, the GOP presidential candidate made new overtures to minority voters Saturday, asserting his party is best positioned to engender social change. "I fully recognize the outreach to the African-American community is an area where the Republican Party must do better," Trump said at a Fredericksburg, Va. rally. "The GOP is the party of Abraham Lincoln. And I want our party to be the home of the African-American voter once again." Trump's comments echoed statements made by House Speaker Paul Ryan in early May, when the nation's top elected Republican said he was "not there yet," to fully endorse Trump. "This is the party of Lincoln, of Reagan, of Jack Kemp," Ryan said in an interview with CNN. "And we don't always nominate a Lincoln and a Reagan every four years, but we hope that our nominee aspires to be Lincoln- and Reagan-esque." Trump's language indicates his campaign is now focused on broadening the candidate's appeal beyond his primary electorate. Reversing the direction of downward polls and developing a more inclusive pool of voters are major challenges for Trump's new campaign leadership, with less than 80 days before the election. "My goal is to provide every African American child with access to the ladder of success," Trump said told the sold-out Fredericksburg crowd. "Which means, good education and a great paying job." Trump elaborated he intends to follow through on promises to minority voters through greater school choices, and an easier ability to start small businesses. The Republican nominee stayed on script and on message in Fredericksburg, refraining from earlier controversial comments designed to court reliably Democratic voters. "Look at how much African American communities are suffering from Democratic control," Trump said in Dimondale, Mich. Friday. "To those I say the following: What do you have to lose by trying something new like Trump? What do you have to lose?" he asked. "You live in your poverty, your schools are no good, you have no jobs, 58 percent of your youth is unemployed. What the hell do you have to lose?" 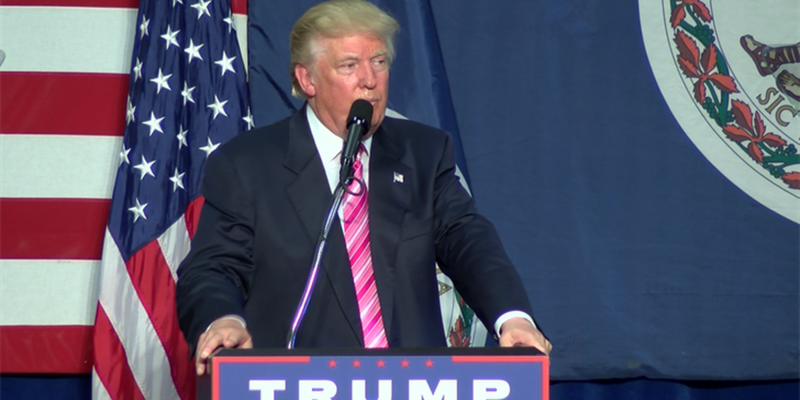 According to the latest poll of Virginia voters released by Quinnipiac University, Trump trails Clinton 50 - 38 percentage points. The survey was conducted Aug. 9 - 16, with a margin of error of +/- 3.5 percentage points.